This Soapstone Incense Burner is hand-carved and imported from India. 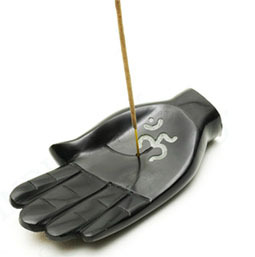 This stick incense burner is featuring a carved out Om symbol in the palm of a hand. This incense burner is 6 inches long and ideal for burning your favorite incense sticks. High quality and hand carved, this unique soapstone burner is a great addition to your home décor.